Anthony Stockton is an internationally renowned expert in the forensic examination of questioned documents and the comparison and identification of signatures and handwriting. He graduated from Kings College London with a Bachelor of Science Honours degree and a Master of Science degree in Forensic Science. From there, he trained as a forensic documents examiner in a large team of experts at the Laboratory of the Government Chemist in London. With over 22 years experience as an expert witness in the Home Office Forensic Science Service, he has examined thousands of documents of evidential value. Anthony utilises detailed observational skills to analyse documents in order to determine authenticity and detect forgery. He has produced results in the form of witness statements and reports used in a court of law and ensured the results and format was understood by all parties. He has remained impartial and independent in all cases balancing the needs and requirements of both sides of a legal case and producing evidence in an unbiased manner. In his career he has worked on many high profile cases, including murders, kidnappings, rapes, counter-terrorism, serious fraud, money laundering, drugs, organised crime, witness intimidation and civil litigation. As the National Lead for the subject, he set and implemented the high standards required by the Home Office. He was responsible for managing the quality of the work across three specialised units of senior scientists in the most serious and high profile casework in the UK. In recent years law enforcement bodies have turned to him to investigate and review serious crimes both in the UK and overseas. He has been recently commended for his work by West Yorkshire Police Homicide and Major Enquiry Team. Until recently he was Chairman of the European Working group for Handwriting within ENFSI where he led on best practice across European laboratories, organised and chaired international meetings and represented the group at ENFSI Board level. He is still an active participant of the group. Anthony was a speciality assessor for the Council for the Registration of Forensic practitioners until its closure and is a trained auditor implementing ISO 17025 standards of accreditation. 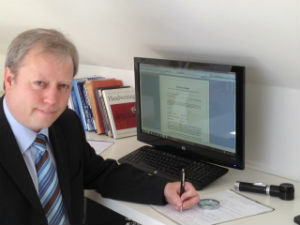 He was responsible for all of the quality procedures relating to Questioned Documents in the Forensic Science Service, where he wrote and implemented all of the standards and competencies for the subject, including validations, in order to maintain the highest standards in casework and accreditation. He is a keen lecturer on a number of degree courses at UK universities, has set exam questions, examined and conducted PhD vivas and sat on course approval panels for degrees in Forensic Science. He has trained and professionally developed forensic scientists in the UK and overseas and has provided speciality training to police forces, government departments and banks. He has a wealth of experience in providing training and consultancy work overseas and has worked on projects in the Middle East, The Netherlands, Trinidad and Tobago and in Hungary where he worked for the Foreign Office on behalf of The British Embassy in Budapest.